Hope you all had a wonderful Christmas surrounded by those you love most!! Ours was so magical and surprisingly, quite relaxing. We don't travel for Christmas and do most of the hosting; I find it easier to be at home with the girls than go a bunch of places and I love to entertain so it was perfect! The girls have stayed busy all week playing with their new toys & games, building lego sets and reading lots of new books so I've had a little more time to sit and drink my coffee without interruption, get organized for the New Year and pack all our holiday decor up. As we approach the end of 2018, I thought it would be fun to share our girls' favorite books from the year. 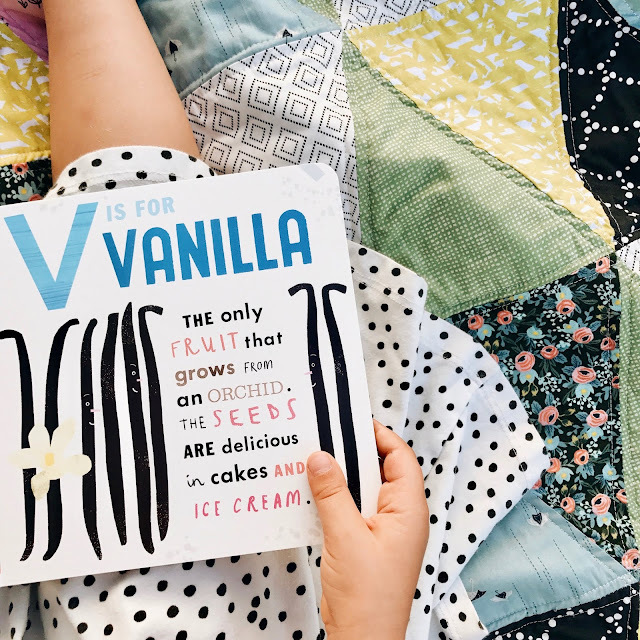 If you've been following along for any length of time, you will know we love beautiful books in our home and it was so much fun to see which books our girls loved reading the most. You can shop all our favorite books and more at here! Christmas is less than a month away and Dustin & I have had so much fun shopping for our girls this year. Olivia and Penelope are at the ages where they totally know what Christmas is about and get so excited about it. The other day we were running errands and Poppy saw a bunch of trees with lights and said, "Mama, Christmas is ALL AROUND!!" and it melted my heart. They are also at the age where they know very specifically what they want. Olivia asked for slippers, new legos & paints and Poppy asked for a triangle. Like, a musical triangle ;) It made me laugh out loud but she's got her heart set on it so of course we will get her one. Della is a little too young to ask for anything but she loves everything her sisters do so she is probably the easiest to shop for. I thought it would be so much fun to share what is on their wishlist this Christmas!! I found the cutest glitter slippers (one) on sale from Mini Boden this past weekend and can't wait to give them to Olivia!! She will also be getting a Cinderella Castle lego set (two) and Poppy will be getting this coordinating lego set. We started getting Olivia legos for her 5th birthday this past Spring and they have become one of the girls' favorite toys. They grew up with Lego Duplos and always loved those but the bigger (smaller pieced) sets are so much fun for them. We use these stacking containers to organize their legos by color and when Della is napping on the weekends they will spend hours playing together with them. Olivia also asked for this Ski Lift lego set to go with her Ski Chalet. Building sets with them is even fun for me!! I've shared this before but I created Amazon wishlists for each of our girls and anytime I come across something they'd like or they ask for something specific, I add it to their list. Then when Christmas (or their birthday) comes, I send the link to family and friends who ask what they'd like. It makes gifting so easy!! The other gifts we are so excited to give them are pretend makeup sets. My best friend has a three year old daughter who has pretend makeup and anytime we are at their house, all the girls love playing pretend with makeup. Poppy even stands on her stepstool when I'm getting ready in the morning and plays with my brushes, its the sweetest thing. They are at the age of loving to play dress up so Olivia and Penelope will each get a makeup set (three / eight - both are so cute in person!) and then a dress up necklace (nine) to go with it. 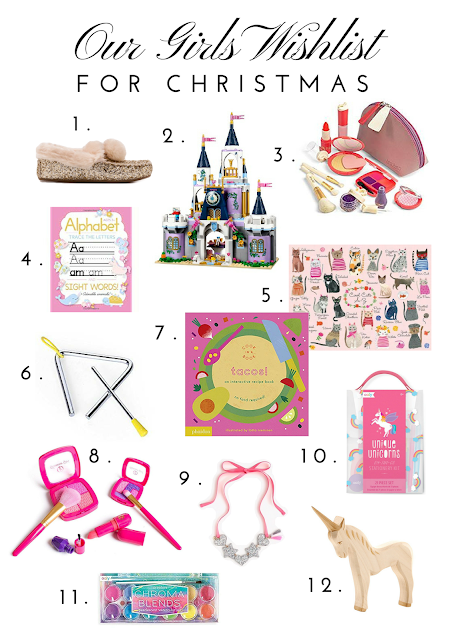 Olivia is learning to write and Poppy of course wants to do everything her big sister does so we are getting this Unicorn stationary set (ten) for Olivia and then the most darling letter tracing practice book for Poppy (four). Other things on their list that family will be gifting them are Cook in a Book! books (seven), cat puzzles (five) and art supplies (eleven). For Della, her favorite toys right now are her wooden Ostheimer animals (twelve) so we will be giving her a few more of those and then the prettiest magnolia quilt from one of our fav shops, Clementine Kids. Happy Weekend!! Hope everyone had a wonderful and restful Thanksgiving with those you love most! We hosted my family, skipped naps and put the girls to bed early then stayed up late enjoying leftovers, pie & playing games. It has been so nice having both Dustin and Olivia home more than usual for the long weekend and being together as a family without any real plans. With all the amazing sales happening this weekend I wanted to share what I've purchased for myself, our girls and gifting incase you are still on the search for that perfect gift!! My all-time favorite Botanical Kinetics lotion is 20% off (and shipping is free! ), no code needed // I also picked up this clay mask to try from the same line. I love gifting the lotion to friends for birthdays and use it every morning and night on my face after the shower and before bed! I have been obsessed with mustard + rust clothing lately so I ordered this cozy sweatshirt in Golden Craft (50% off!) and these sweater leggings from Aerie/AE - 40% off and free shipping, no code needed. My fav custom jewelry is 20% off - Dustin gave me this dainty bar necklace for our anniversary in September with the girls' names on it (in rose gold!) and I wear it every single day. BeautyCounter is having 15% off and free shipping on orders over $50 so I grabbed the tinted moisturizer I use daily, Dew Skin, and also a tube of my fav shade of their Color Intense Lipstick - Twilight. Everything at Mini Boden is 30% off with code V4N9 // I love their cable footless tights (lots of colors, only $11.20 each), pajamas and underwear sets for the girls - best quality, so soft and last wash after wash! Our fav bow shop, Wunderkin Co., is having a huge Cyber Monday sale with $5 bows - a perfect time to stock up at a huge savings! Bows make the perfect stocking stuffers! Poppy and Olivia love wearing nightgowns so these long sleeve ones from Tea will be part of their Christmas gifts // Less than $20 after code CYBER30 - more than 50% off the original price. They are so soft!! What do you have your eye on this weekend?! So excited to start wrapping gifts when everything arrives!! Happy Monday!! Even though Thanksgiving isn't quite here, with all the snow we've been having lately it has me in the holiday shopping + decorating mood. One of my favorite ways to celebrate the holiday season with my girls is with stockings. I remember as a little girl having so much fun opening the small wrapped gifts from my stocking and we've loved carrying on the same tradition for our girls. We keep gifts pretty simple (usually just a few things for each of them) so putting stockings together is one of my favorite things! 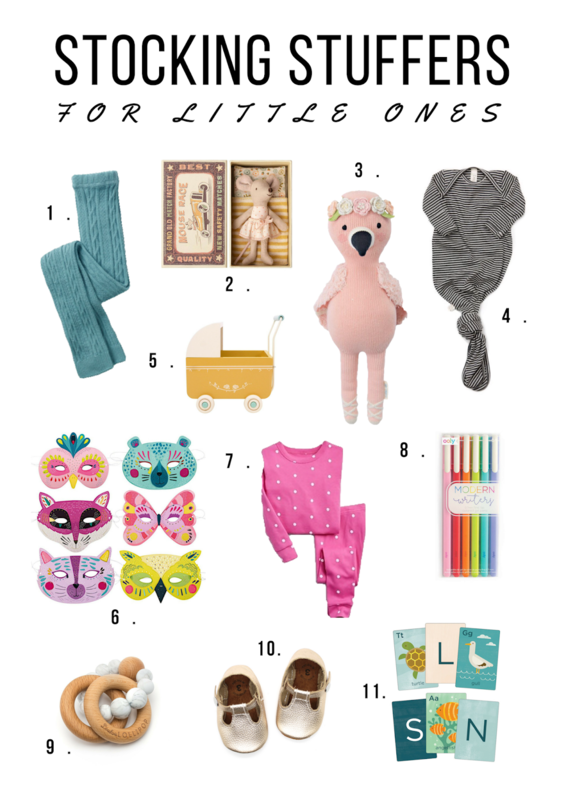 So excited to share all my top picks for Stocking Stuffers this season for your little ones! When gifting, whether in stockings or not, I try to give a mix of gifts that are practical and will be used (clothing, shoes, art supplies) and fun (play masks, toys, cuddly animals). The girls will each be getting a pair of our fav ever cable knit tights (one) in different colors. They are so warm and cozy and perfect with dresses and oversized sweaters all Winter long. We especially love them paired with these dresses. Olivia and Penelope love playing pretend with their Maileg mice (two) so its always fun to add a few new ones to their collection. I thought this little yellow pram to go along with them (five) was so darling. I've shared about Cuddle + Kind before and how much we love their dolls (three). For each doll purchased, they donate 10 meals to a child in need. Their dolls come in two sizes so you they are perfect for little babes and bigger kids alike. How sweet will this Penelope Flamingo be sticking out of the top of Poppy's stocking?! Our girls love dressing up and I thought these colorful masks (six) were so much fun, along with some new gel pens for Olivia (eight) since she is learning to write and ocean life flash cards (eleven) for all three of them to play with. I love putting rolled up pajamas in their stockings and can't ever resist a good polka dot. I bought the pink polka dot ones (seven) for Della a few weeks ago and sadly they're now sold out but found similar ones here in blue. Hoping the pink ones come back in stock because they are so bright + fun. Of course with three little girls, shoes almost always make their way in to stockings or under the tree and this year we'll be giving our fav Mon Petits in White Gold. Both Poppy and Della wore the soft soles (ten) since they were just tiny babies and now that Adaline is almost 2 (what???) we are upgrading her to Mon Petit hard soles in the same gorgeous White Gold - love the neutral color because it pairs with everything so nicely plus its festive for the holidays! If you've got a little babe, I am loving Childhoods new knotted sleeper (four) which come in lots of different colors and this pretty marble teether (nine). Another favorite go-to gift for stockings are the softest swaddles ever from Max + Moose. We have lots of these from when Della was born and they are still her very favorite. Think of your favorite tee in swaddle form...so cozy that all three of our girls snuggle with them. Happy Friday!! 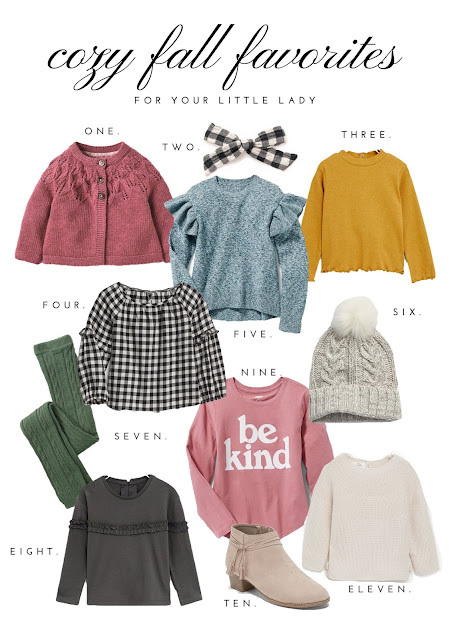 We've had cooler weather all week and it has me dressing our girls in cozy sweaters, leggings and boots and I just had to share all my favorite pieces for the season with you guys!! 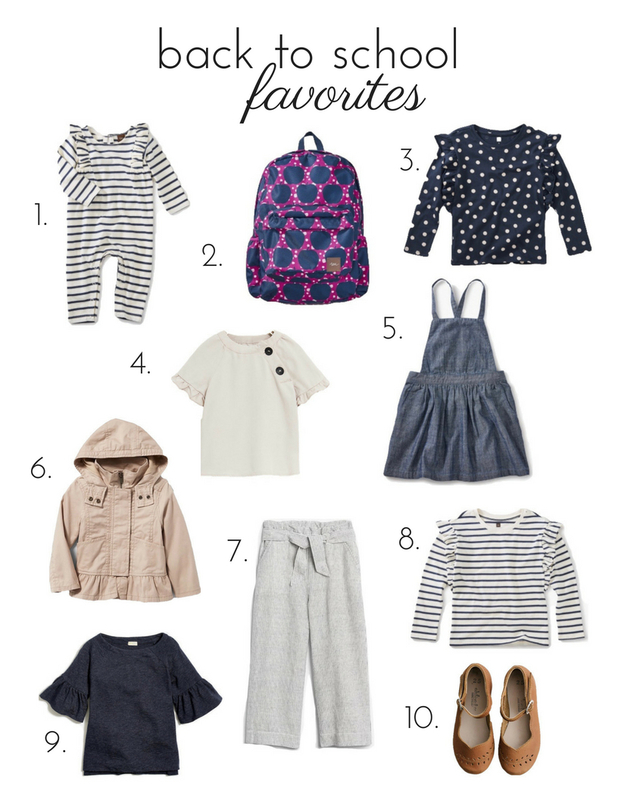 Dressing three little girls is so much fun, and because living minimally is so important to us, I always search for pieces that are simple, timeless and can be mixed and matched easily (aka: neutrals) so we can maintain a capsule wardrobe. Each season I add a few new pieces that will pair well with what they already have and my #1 rule when shopping for them: I only buy pieces that I LOVE!! Our girls are 5, 3 and 20 months so right now I can shop across baby girl, toddler and girls -- such a wide variety!! I tried to include pieces above for all different ages since mine are in such a range. Give me all the cable knit tights, pom poms and buffalo check this season. Oversized sweaters, simple tops and items for layering keep our girls comfortable, stylish and of course, warm & cozy as the chilly air sets in. What items are you loving this season?? It's thunderstorming outside, all the windows are open and my babies are napping. The sound of nothing but the rain falling always puts me in such a place of peace and inspiration. I feel like it's been quite some time since I've written here (like, really written) and with a lot of opportunities for reflection over the past few weeks, I wanted to share something that is so apparent in my own life right now that chances are, as a Mom you are facing too. On our way to Kindergarten last week, on Olivia's first day, as I was driving she said to me from the back of the car, "Mom, you don't need to come in with me. You can just drop me off at the curb. I'll be just fine." Cue all the mama emotions. (Spoiler: I still went in that morning and proceeded to walk her in all week long. Oh and I told her she isn't allowed to call me Mom until she is at least 10, it will be Mama until then). Then today for the first time, I pulled the car up and dropped her off at the curb and watched as she walked in on her own. I trusted that she would make it to her classroom all by herself, that she would find her hook and hang up her backpack and put her lunch where it needed to go. And that she could do it without me. As I drove away from the school, I thought to myself, "I just did it. I just took one more step of letting my baby girl go." Even though it may seem silly or small, for whatever reason it was so significant to me. 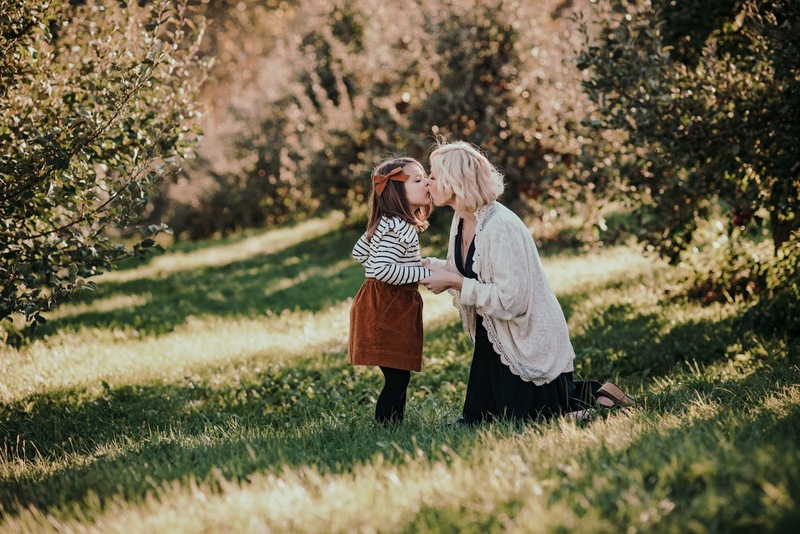 And it was then that I realized such a core truth of motherhood -- you learn to let go a little at a time, and how we hold the moments we are given with our children is what matters most. Maybe you're as sad reading that as I am writing it, but over this past Summer and in to Fall I have found that to be so true. It is what shapes how I approach every single day of motherhood. Even the chaotic, overwhelming, messy, noisy days. 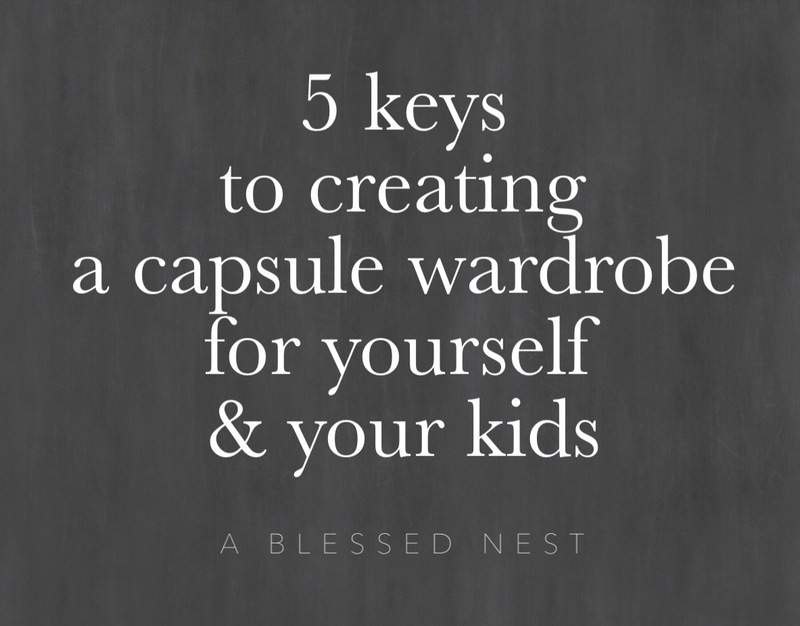 The ones where you are totally late to everywhere you're going and forget your kids' shoes or snacks or move from diffusing one tantrum to the next (maybe even because of the lack of said snacks). The ones where you're totally convinced you could handle another baby or the ones where you aren't sure how you kept all of your kids alive. The ones where you feel like you're sinking and flying at the same time. The ones where your youngest refuses to get off an elevator and then you're trying to jam the doors open as they begin to close so she doesn't get trapped inside without you and then you drop your parking ramp ticket down the elevator shaft in an effort to pull her out. Yes, that happened yesterday. The ones where you don't know what you're doing but you're just so grateful you get to do it. That God trusted you with these tiny humans that are imperfect yet so very perfect all at the same time. Do you ever have any of those?? For the first time in 5 years, we no longer need a stroller everywhere we go. I can run errands without a diaper bag and pregnancy seems like a lifetime ago. I've since forgotten the fog of the newborn days and exahustion of the sleepless nights and I may even appear like I have it more together than I did back then (another spoiler: I don't). We no longer have bottles on our counter or swaddles in our laundry baskets. And to be totally honest, I feel equally excited and sad about that at the same time. Let's get real though, I want like 10 more babies so mostly just excited. I have often heard it said, "The days are long but the years are short" and I don't know if I've ever found any quote to be more true. I had friends ask me how it felt sending Olivia to Kindergarten and if I was happy or sad and it got me wondering: how did we get here?? How did we get to the point that my first baby, the little girl that made me a Mama back when I was just 23, was already 5 and going off to Kindergarten?? I realized that so much had happened over the past 5 years and I began reflecting on how I held on to the moments I had with her. The small, simple ones where she'd come and sit next to me on the couch without saying anything or tell me her three favorite parts of the day at bedtime while holding my hand. 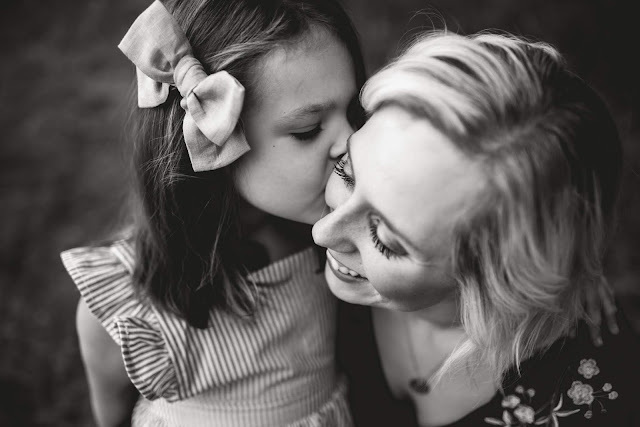 And the big, exciting ones where she learned how to walk and talk, write her name and fold her own laundry, paint and draw and then to teach her baby sisters how to do all the things she had mastered and loved so much. And the everyday moments in between. The hundreds of meals we have shared and the countless times I have braided her hair and snuggled in bed or listened to her pray with a soft, gentle voice. The moments I rubbed her back or sang her a lullaby or rocked her or read books to her or watched her play with bubbles in her bath as a little baby. Her first giggles, first smile and first curls. In only a matter of minutes, hundreds, thousands of moments came flooding back to me. I'd held on to each and every one; I'd been present in the moment with her, and after living it, tucked each one away in my heart for a day like today. A day where I had to let a little more of her go. I could grab hold of these memories and look back on them with so much joy and it lessened the sadness of the letting go. If you are a mom, you certainly know this feeling well. Maybe it's sending your baby off to preschool, kindergarten or elementary school. Maybe it's a certain age or birthday celebration (doesn't 5 seem so much older than 4??). Maybe it's something they accomplish or something they say that makes you realize how much they've grown. Or maybe they go to bed one night and just wake up looking like a big kid instead of your little baby and you find yourself with a pit in your stomach wondering how so much time passed and how you can slow it down or stop it altogether. So whether the moments come easy or land hard, are loud or silent, hold on to them. Let them happen and be present. Laugh with your babies and cry with them. Let them be little and be quick to forgive their mistakes and messes. Focus less on correcting and more on connecting. Chase each other at the playground instead of observing from the bench while your husband chases them. Say yes when they request to sing a song to the baby you're rocking instead of getting in to bed. Read them the extra book, snuggle for 5 more minutes and just lay in stillness with them in your arms and hold on to the moment. It is in these small, seemingly insignificant moments that we are truly alive. That we are truly in our calling. That we can truly let it sink in how incredible it is to be called Mama and to have the privilege of raising these children. It is in these moments we cultivate a heart of thanksgiving. Of contentment. Of joy. Of connection. Of peace. Of significance and purpose. It is these moments that make up a life well lived. And how wonderful that we get to live it well, with our babies, every single day. September is HERE and it's one of our favorite months of the year! 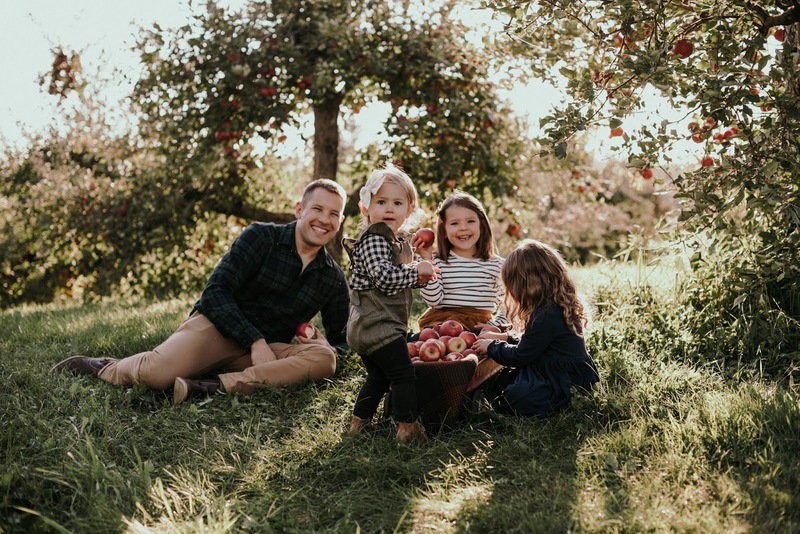 Olivia starts Kindergarten next week, the temps are dropping (yessss), we've got lots of birthdays to celebrate, our favorite apple orchard just opened for the season and so much more!! Hello, FALL! You're our favorite and we missed you. I've shared a lot about how minimal living matters so much to us and I often get asked about how I handle gifts for the girls, especially for birthdays & holidays. I thought it would be fun to share a few tips on giving + receiving gifts if you are pursuing minimalism and then also share what is on Poppy's wishlist this year! She turns 3 next week and she requested to go out to the original pancake house for breakfast and have balloons, confetti and brownies. Girl after my own heart. Her two favorite things ever are princesses and art (especially painting), so those themes are what her gifts center around. Poppy asks to paint, color and do watercolors pretty much all day long. We can most often find her sitting at our kitchen table with some kind of art project out. Covered in whatever art she is doing ;) Olivia has a set of Kid Made Modern watercolor paints that Poppy always wants to use so of course we put her own set (9) on her birthday list this year. For her, it's a major bonus if the pictures she is painting are of princesses and the "Fairest of All" watercolor book (10) is one of the girls' favorites so I ordered another set that came with two other princess books. Something new we are excited to give her this year are Ooly watercolor crayons; they look like so much fun with (hopefully) little mess. My parents got her the glitter set (3) and this classic, neon & metallic set. By far my favorite gifts to give are "activity" gifts -- things that will be used often and enjoyed over and over. Other favorite things of hers are beads, stickers (7) and legos. This new Petit Collage bead (6) set looks so darling. We also love the B. brand Pop Arty beads, which Olivia and Penelope sit and play with daily. Olivia received a lego set for her birthday back in May and since then we've added a few to her collection for sticker chart rewards. She sits for hours building the sets, following step by step instructions and having so much fun seeing what she can create. Poppy always sees Olivia doing legos so she asked for her own set for her birthday. There are so many fun Lego Juniors Sets (4) and even some for 5-8 year olds that she will be able to put together with a little help from us. This Surf Shop set is a favorite of Olivia's and I recently picked up this one on sale for her for Christmas this year. Beyond art supplies, we are giving Poppy a new rainbow pillow for her bed (8) from one of our favorite shops, BlaBla Kids, because she is all about green and blue lately and the girls talk about + draw rainbows nonstop. She also loves Maileg mice (just like her big sister...noticing a theme here?!) and I thought this wooden pram (2) was so darling to add to her collection. Last but not least, the tea set (5) is a toy we already have but thought it would be perfect to share. We've had ours for years in the girls' play kitchen but about a month ago I was trying to come up with a way to make bathtime a little more exciting without buying new bath toys. I had the idea to set up a tea party for Olivia and Penelope and their green toys tea set (5) became the perfect bathtime toy. They love having tea parties in the tub with lots of bubbles and because the set is so lightweight, it floats in the water! 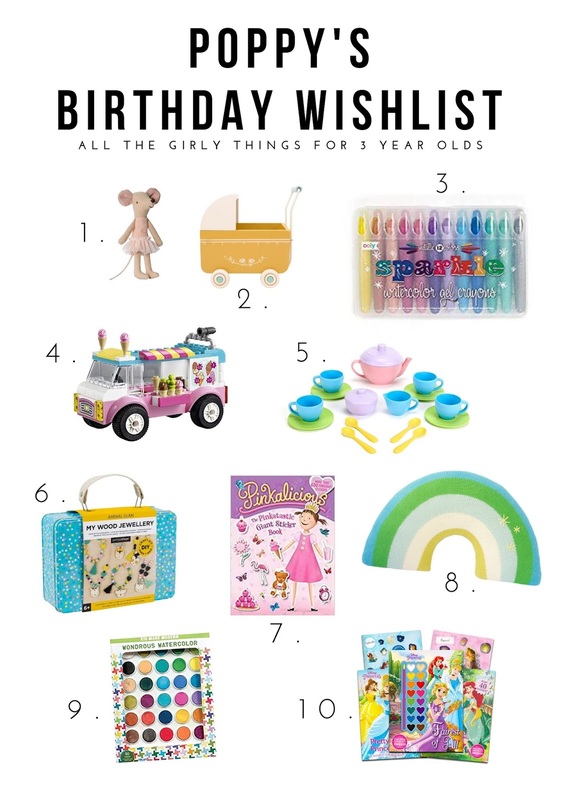 For whosever birthday it is, we let each of their sisters pick out a small gift for them (such a fun tradition) and then I also create an Amazon Wishlist for friends & family. If you haven't yet heard of this, it is a game changer when it comes to gifting! On Amazon, you can create a custom Wishlist (under LISTS) and add whatever items you want. I have an ongoing list for each of our girls and whenever I come across something I know they'd love, I add it. Then as birthdays approach and family starts asking what they can get our girls, I just send them a link to the wishlist! They can order directly from Amazon and everything is marked off once it is purchased so you don't end up with the same item twice. I absolutely love this because then our girls are given gifts they will actually use and enjoy -- and because Grandparents seem to insist on buying things for them to open, this is the perfect solution. August has come and gone so quickly, perhaps the fastest of all the Summer months, and we have been filling it to the brim with all our favorite things before Summer officially comes to an end. 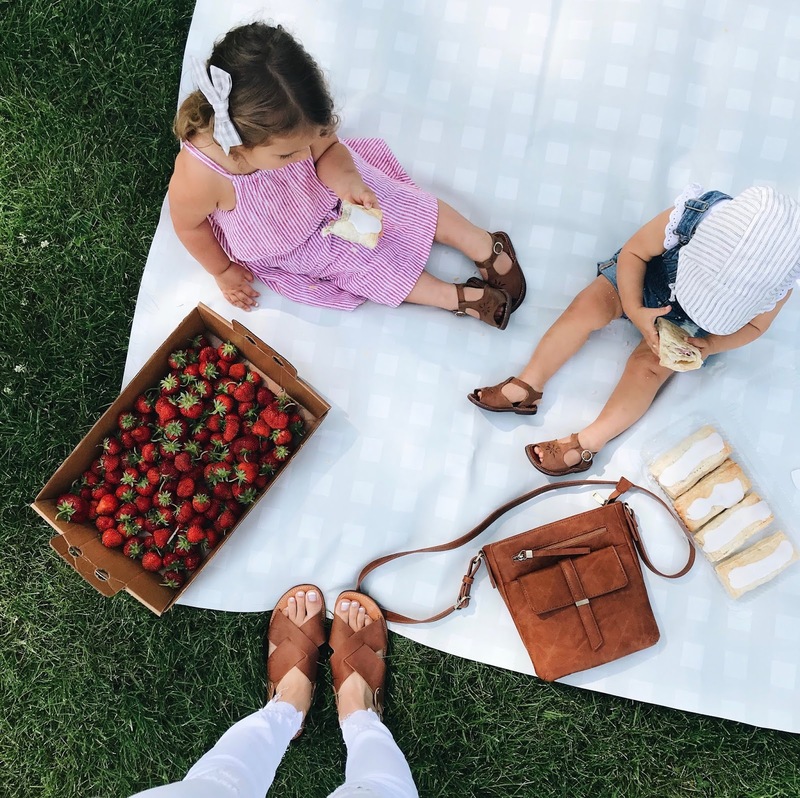 Olivia doesn't start school until mid-September which is so nice -- it feels like we have a little extra time to fit in everything on our Summer Bucket List. But let's get real, we love Fall more than any other time of year so we are just a little bit excited September is only days away. We spent the weekend at the State Fair with Olivia and we have our End of Summer lifestyle session this week and then a fun apple orchard session planned for later in September so finalizing all the details and picking outfits for that has been so much fun. September 1st is our wedding anniversary which makes this time of year extra special. Both my parents' and Poppy's birthday are all in September also, and then Dustin is early October. That plus falling leaves and apple-everything brings so much to look forward to. We've had some cooler days lately and lots of thunderstorms which make the house feel extra cozy and reminds us that Fall is right around the corner. Sleeping with open windows is one of my very favorite things and feeling a cool breeze come in through the kitchen as I'm making breakfast just makes the morning even better. Rounding up a few of my favorite Fall things today incase you love the upcoming season as much as we do!! Of course Fall brings cooler temps and new mugs are a must as the air chills. I love the look of enamel mugs (1) and drinking from them makes me feel like I'm seated around a campfire. We love making hot apple cider on the stove (especially when entertaining) with cider from our local orchard, cinnamon sticks, mulling spices and fresh orange slices. It makes the house smell amazing and gets better the longer it steeps. I keep a mug rack out filled with my favorite mugs and then guests can each choose one and enjoy. We also love hot cocoa with our girls and my go-to drink before bed is a cup of peppermint leaf tea (this kind is my fav). Give me all the festive mugs. For creating the most amazing smelling home (with so many benefits far beyond that), we love using our essential oil diffusers and the lantern diffuser (2) is my absolute favorite for rainy days and at bedtime. My go-to diffuser blend for Fall is 3 drops orange + 3 drops cinnamon bark + 2 drops cardamom -- unreal. I also love pine in the diffuser mixed with lavender or northern lights black spruce, our 'sweater weather' blend. Diffusers are an amazing alternative to burning candles (which are often super toxic!) and this one can be set on a candle-flicker mode that is so dreamy day or night. Of course, no change of season is complete without new books. I've had The Thank You Book (3) on my wishlist for our girls for sometime now and can't wait to give it to Poppy for her birthday. The illustrations look so darling. Another new favorite is Platters and Boards (5), which is so perfect for Fall entertaining and gatherings of all sizes. 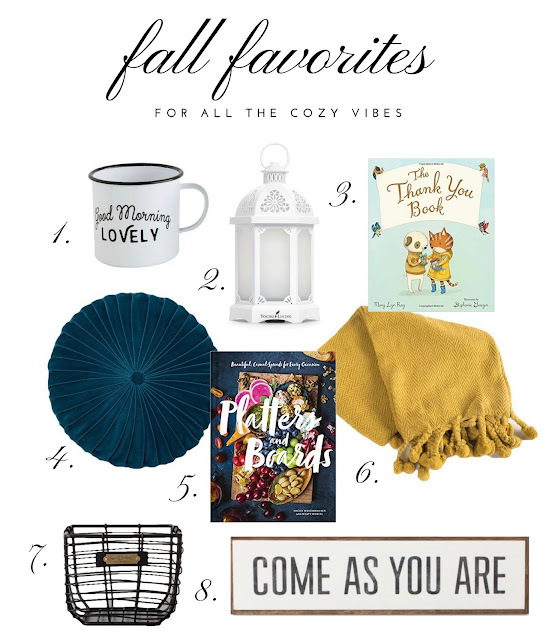 What better way to welcome Fall than curled up under a cozy pom blanket (6) with new books to look at?! As the leaves begin to fly I love pulling out extra throw pillows for the girls' beds and our couches and this opalhouse pillow (4) stole my heart with its deep navy color. So soft and cozy! Wire baskets are perfect for holding pillows, blankets and even favorite books so they're easily accessible for little ones. I recently got this black wire one (7) and love it. It comes in two sizes -- I use the smaller one in my bathroom for oils and the larger ones spread throughout our home for toys and stuffed animals. Last but not least, the come as you are sign (8) is perfect for a dining or living room and is currently on sale!! I feel like we do the most hosting in the Fall as our small groups get up and rolling and we have lots of birthdays to celebrate so its always fun to add a few new pieces to our walls or switch up what we have hanging up for a new look. Hi friends!! Hope you are having the BEST summer ever so far! We have been busy spending our days outdoors, eating lots of popsicles (these are our fav! ), playing in the sprinkler, park hopping and enjoying the endless sunshine. The girls are all so tan and every day I envy their dark olive skin (which they definitely got from Dustin). Della is a little blondie, which is so much fun to see since her big sisters are brunettes and between her tan skin + wispy blonde hair it has me hoping Summer never ends. Olivia did ask me the other day, "When will Fall be here?" and although it feels so far away now, Summer is going by so much faster than I realized so I thought I better get back to the blog before any more time passed!! It has been so refreshing & rewarding to really step back and focus on my girls but I still love coming back to this space to share and for all of you who are still reading & following along, I so appreciate it!! 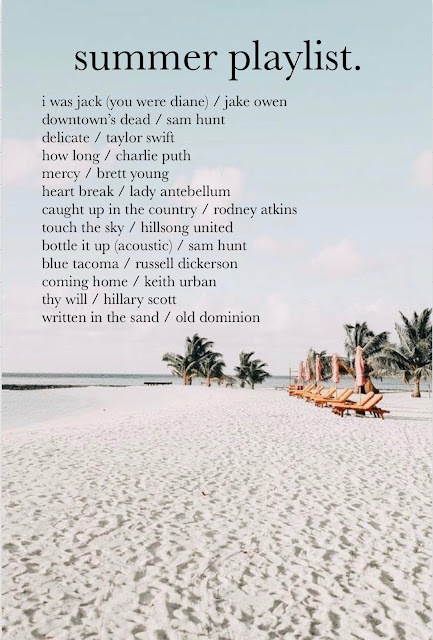 Whether we are playing inside or out, cooking breakfast, cleaning the house or grilling in the backyard, we almost always have music on and I thought it would be fun to share our Summer Playlist if you are on the search for some new tunes!! I often share my fav songs in my instastories and get asked for playlists. They are always heavy on the country but usually have a good mix of sounds + moods and we always find a way to dance to them. Poppy usually wakes up from her nap and says, "Mama, can you put music on for me?" and we dance together in the kitchen. One of those things I never want to forget. Find last year's Summer Playlist here. I've shared about minimalism over the past few years of blogging and how it's brought our family so much freedom and peace of mind. Since getting married in 2012 and then having Olivia in 2013, we have been pursuing minimalism as a couple and family and have been able to get rid of about 75% of our belongings over the last 5 years. I had the chance to speak on this topic to my MOPS group this past Spring and it sparked so many amazing conversations and got so many Moms thinking about it and wanting it for themselves, and because it's been so life changing for us, I thought it would be fun to do a post that offers a good overview of minimalism if you think it might benefit you & your family too! I am going to bulletpoint what I think is most important that you know about minimalism and then give you some steps to get started! I also have all my favorite articles linked under my minimal living page to serve as resources. first off, download the YouVersion bible app on your iphone (its free) and complete the 14-day devotional "the more of less: a guide to less stuff and more joy" -- this is a great introduction to what minimalism is and asks thought-provoking questions to help you understand why you want to pursue it and gives practical steps to take, all with a biblical foundation. You can even do it with friends -- or your husband! -- and there is a "talk it over" portion after each reading where you can share your thoughts. If I have a friend who asks me to help them minimize, this is the first "homework" I give them, and I do it with them so I can get an idea of why they want to start and what they most hope to get out of it. Let's say you choose KIDS >> BOOKS. Go through all the children's books in your home, wherever they may be. Which books do your kids never reach for? Which books do you not actually enjoy reading to your kids? Which books are falling apart so much that you can barely read them? Depending on how many you own, try to get rid of at least 1/3-1/2 of your collection. Pass them along to friends whose kids might enjoy them, bring them to "Little Free Libraries" around your city or donate them. If you're still left with a good size collection, categorize them and put them in clear plastic bins with labels (for example, by season or by theme...winter books, nature books, summer books, animal books). Store all the labeled bins in an empty closet and pull one bin out per month, rotating through the bins one at a time. Include your kids in picking which bin to pull out and have them help you put the books on the shelves. You will be amazed at how much more your kids enjoy reading the "new" books and you will have bookshelves that are clutter-free and bookcases that aren't overfilled. Chances are, your kids won't even notice you got rid of half your collection and you'll love how much quicker they can be picked up and the new spark your kids will get from them. Reading will become more fun for both you and your children. Let's say you choose KITCHEN >> DISHES. Most everyone has cluttered kitchen cabinets with little to no space for anything, even to put clean dishes away. Because of minimalism, we are able to live with so much empty and open space in our cabinets and always know where each specific kind of dish is. This makes mealtime and emptying the dishwasher stress-free. Chances are, you have at least a dozen sippy cups, half of which are missing lids or straws or spill everytime you use them or are ones your kids don't even like, etc. Keep 1-2 sippy cups (per child) that are used daily and get rid of the rest. Same is true with kids plates and bowls. How many do your kids use in a full day? Keep only that many and then run the dishwasher at night and you'll have them for the next day. Go through your own dish sets -- do you have a mix of dishes from your wedding registry, random dishes you've picked up during Target clearance sales and then dishes that don't match anything else in your kitchen or dishes with chips or that are cracked and broken? Pick one style set for your family and get rid of everything else -- ask a friend if they could use them or contact ministries or organizations in your area. Our church works closely with several that are always needing extra dishes. Do the same with silverware. Does your kid actually need 12 plastic forks?? Probably not ;) You get what I'm saying. It sounds so funny but this is actually the reality of it: people own so much more than they even know and often, it is stuff that has accumulated over years and years without even realizing it. These are just two examples, but I think the biggest mistake people make when starting to pursue minimalism is feeling like they need to purge their entire home in one day and they get so overwhelmed they don't even know where to start and then they don't start at all. Start small, with small spaces and small categories that you can tackle in an afternoon. Try to take on one of these every day, even if for only an hour while your kids nap or in the evening, put a movie on for them and ask your husband to watch it with them while you do some decluttering. Dustin continually says one of the things he appreciates most about me is my passion for minimalism -- it has impacted both him and myself, our marriage, our home and our family is such incredible ways. If your family understands the benefits it brings, chances are they are going to be supportive and willing to help you as you spend some time working through your home to minimize. third (and lastly), put a "one in, three out" rule in to place. This means, for every ONE thing you bring in to your home (with the exception of necessities like food, toilet paper, diapers, etc), take three things out of it. Did your child get a new toy? Have them select three toys they no longer play with (or if they're too little, pick them yourself) and pass them along to kids who will play with them. Buy new shoes for yourself? Go through your closet and pick out 3 pairs you haven't worn in years or that no longer fit you. Keeping this rule in place will help ensure that all the hard work you've done to minimize won't be erased in a few months. Being mindful of what you bring in your home -- and continuing to get rid of what you don't use/need regularly helps you to always be in a forward motion instead of minimizing for a month and then accumulating it all back the next.